This past week I was delivered a beautiful bouquet of flowers courtesy of Flowerspot.com. I was able to visit the website and browse their special collection in honor of Mother’s Day. I’m not a huge fan of red roses… or any roses for that matter… so when I saw the amazing Mother’s Day selection… I was so excited! I ordered myself “Lavender Indulgescents“. 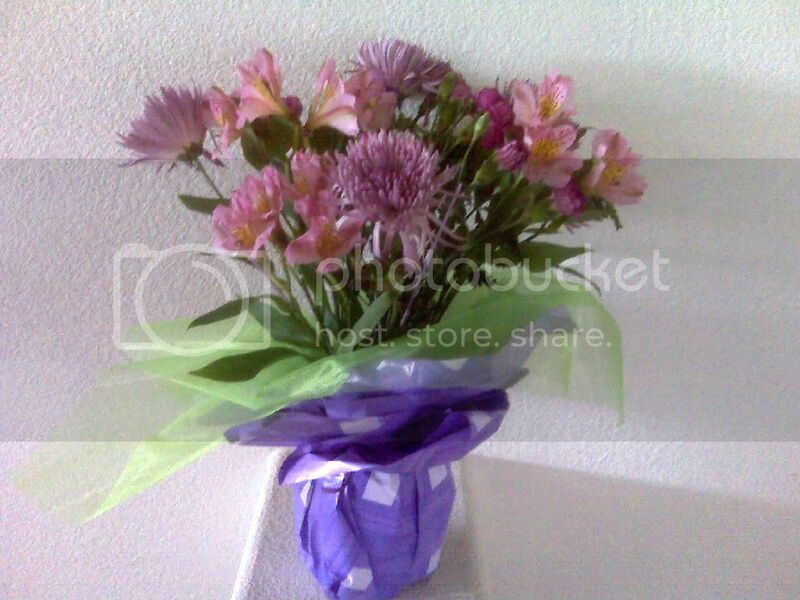 The description says that it includes “six graceful lavender mums, six stems of mini-carnations, three alstoemeria, and other lavender flowers”. It also comes in a vase wrapped in pretty lavender paper. The “scent” part plays a large role in thie bouquet. It gives off a relaxing lavender scent. Let me be honest with you. I know NOTHING about fresh flowers. If I get flowers… I grab them at the grocery store. Now that I’ve had fresh flowers delivered… grocery store flowers should be outlawed! Opening up a box of fresh flowers is a different kind of experience for the newbie. I was worried about them… I wanted to mother them. They didn’t look like the picture and I was so afraid for them! But… fear not… I followed the care instructions and put them in a nice place. By morning… they were in full bloom… tall and strong and gorgeous! I’ve had these flowers for a week now and they are still going strong. It’s unbelievable! They are said to bloom to maturity over 3-7 days. I had no idea flowers could even DO that! (I know… over kill on the exclamation points… but I’m just like… WOW! Tweet about this giveaway… be sure to link it up! This contest will end rather quickly on Saturday, April 24th at Midnight PST. AND OUR WINNER IS… 5! LAURA! CONGRATS! I know this may sound strange but I absolutely LOVE tulips and so the Tulip Time Spring Assortment would be perfect for me! Love it! I love the lavender roses. So unique. I also became a fan of Flowerspot on Facebook. I love the Premium Lavender Roses. I follow FlowerSpotTweets on Twitter @mami2jcn. I LOVE that they have a natural aromatherapy category – I always order the stargazer lillies because they can fill a whole room with their scent. Now I know there are others … and I'm about to order them for my mom and mil! I like the Lavender indulgescents too! Very Pretty! Mrscaz at gmail dot com. I like the Pink Passion and Roses bouquet among many of the designs at Flower Spot. I just plain love flowers! love the fancy flight bouquet! and thank you for the chance to win some beautiful flowers!